Executive summary: 10th President of the U.S.
Tenth president of the United States, born at Greenway, Charles City County, Virginia, on the 29th of March 1790. He was the second son of John Tyler, Governor of Virginia in 1808-11 and United States district judge in 1812-13. The family was of English descent, but the claim of relationship to the famous Wat Tyler, though always stoutly maintained by President Tyler, cannot be substantiated. 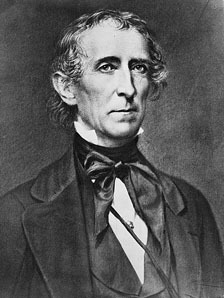 John Tyler the younger entered the grammar school of the College of William and Mary, at Williamsburg, in 1802, and graduated in 1807. Two years later he was admitted to the bar. His public life began in 1811, when he was elected a member of the Virginia House of Delegates. Here he served for five years, being chosen also in 1815 a member of the council of state. In 1813 he raised a company for the defense of Richmond against the British, serving subsequently in minor operations elsewhere. From December 1816 to March 1821 Tyler was a member of the national House of Representatives. A Republican in politics, and a firm believer in the doctrines of strict construction and state sovereignty which Thomas Jefferson had been principally instrumental in formulating, he opposed consistently the demand for internal improvements and increased tariff duties, and declined to follow Henry Clay in the proposed recognition of the independence of the Spanish colonies in South America and in the Missouri Compromise legislation. For the conduct of Andrew Jackson in Florida, in the summary execution of British spies Alexander Arbuthnot and Robert Ambrister, he had only strong condemnation. He declined a re-election to the House in 1821. In 1823-25 he was again a member of the Virginia House of Delegates, and in 1825-27 was governor of the state. In 1827 he was elected to the United States Senate to succeed John Randolph. In 1829-30 he also served as a member of the Virginia constitutional convention. Tyler's career as senator was marked by a degree of independence which at times made his party position uncertain, notwithstanding the fact that his political ideas continued to be those of a strict constructionist. Believing protective tariff duties to be unconstitutional, he voted against the "tariff of abominations" in 1828, and also against the tariff of 1832, since the latter measure, though reducing duties, showed no abandonment of the protective principle. The compromise tariff of 1833, made necessary by the hostile attitude of South Carolina, owed its inception largely to him, but he voted against the "force bill", an act for enforcing the collection of duties, being the only senator whose vote was so recorded. His hostility to a high tariff policy, however, did not prevent him from condemning the South Carolina ordinance of nullification; and in the presidential election of 1832 he supported Andrew Jackson, to whose political principles and methods, as to those of his advisers, he was invincibly opposed, as the "least objectionable" of the various candidates. The vigorous course of the president towards South Carolina, however, led him, after 1833, to act more and more with the opposition which presently became the Whig party; but he was never at heart a Whig, at least as Whig principles came later to be defined, and his place is with the Democrats of the Calhoun school. He sought to incorporate in a new code for the District of Columbia, in 1832, a prohibition of the slave trade in the district, at the same time opposing the abolition of slavery there without the consent of Maryland and Virginia, which had originally ceded the district to the United States. In the controversy over the removal of the government deposits from the Bank of the United States he sided with the bank, and voted for Clay's resolution censuring Jackson for his course in the matter. In 1833 he was again elected to the Senate, notwithstanding the criticism of his independent attitude and the wide approval of Jackson's policy in regard to the bank. In the election of 1836 Tyler was supported as a candidate for the vice-presidency by the friends of Hugh L. White of Tennessee, the Democratic candidate opposed to Martin Van Buren, and received 47 votes, none of them from Virginia. When the legislature of Virginia voted instructions to its senators to support Senator Thomas Hart Benton's resolution expunging from the journal of the Senate the resolution of censure, Tyler, though admitting the right of instruction, could not conscientiously obey the mandate, and on the 29th of February 1836 he resigned his seat. He was by this time reckoned a Whig, and his refusal to favor the Van Buren administration lent color to that view. In 1838 he became once more a member of the Virginia House of Delegates, and in the same year was chosen president of the Virginia Colonization Society, of which he had long been a vice-president. In 1839 he made an unsuccessful contest for the United States senatorship. In December of that year the Whigs, relying upon his record in Congress as a sufficient declaration of political faith, nominated him for vice-president on the ticket with William Henry Harrison, expecting that the nomination would win support for the party in the South. Harrison and Tyler each received 234 electoral votes and were elected. On the 4th of April 1841, one month after inauguration as vice-president, Harrison died, and Tyler became president. He retained Harrison's cabinet until his veto of the bill for a "fiscal corporation" led to the resignation of all the members except Daniel Webster, who was bringing to a close the negotiations with Lord Ashburton for the settlement of the north-eastern boundary dispute; and he not only opposed the recognition of the spoils system in appointments and removals, but kept at their posts some of the ablest of the ministers abroad. He stood, however, as it were, midway between the two great parties, without the leadership or support of either; Van Buren, whose influence in the practical working of politics was still great, refused to recognize him as a Democrat, and the Whigs repudiated him as a Whig; while with Clay leading the majority in Congress, harmony between that body and the executive was from the first impossible. The annexation of Texas, achieved just before the close of his administration, seemed to commend him for a second term on that issue, and in May 1844 he was renominated by a convention of Democrats, irregularly chosen, at Baltimore. The majority of the annexationists, however, would not support him, and he had further to meet the opposition of Van Buren, who had failed to secure the nomination in the regular Democratic convention, and of James Knox Polk, the regular Democratic nominee. Tyler accepted the Baltimore nomination, but on the 20th of August withdrew from the contest. From this time until the eve of the Civil War, Tyler held no public office, but his opinions on political questions continued to be sought, and he was much in demand as a speaker on public occasions. In December 1860, when South Carolina adopted its ordinance of secession, Tyler, though sympathizing with the state, took firm ground against disunion and exerted himself in behalf of peace. The legislature of Virginia appointed him a commissioner to confer with President James Buchanan and arrange, if possible, for the maintenance of the status quo in the matter of Fort Sumter, in Charleston harbor; but his efforts were unavailing. He did not abate his activity, however, and the Peace Congress which assembled at Washington on the 4th of February 1861, pursuant to a resolution of the Virginia legislature, and over which he presided, was largely the result of his labors. The constitutional amendment proposed by the conference, however, did not meet with his approbation, and his action in signing and transmitting the resolution to Congress was merely formal. On the 13th of February, while absent in Washington on this mission, he was elected to the Virginia convention at Richmond, and took his seat on the 1st of March. In the convention he advocated immediate secession as the only proper course under the circumstances. He continued to serve as a member of the convention until it adjourned in December, in the meantime acting as one of the commissioners to negotiate a temporary union between Virginia and the Confederate States of America. He was also a member of the provisional Confederate Congress from May 1861, when the capital of the Confederacy was removed from Montgomery, Alabama, to Richmond. He was elected a member of the House of Representatives of the permanent Congress, but died on the 18th of January 1862, in Richmond, before that body assembled. Democrat, switched to Whig. Expelled from that party in 1841.